~Featured in Cosmopolitan Magazine & Apple's Apps We Love~ Get started with FREE cocktails. A fully sortable, searchable database. Fancy a martini or margarita? Holidays coming up? 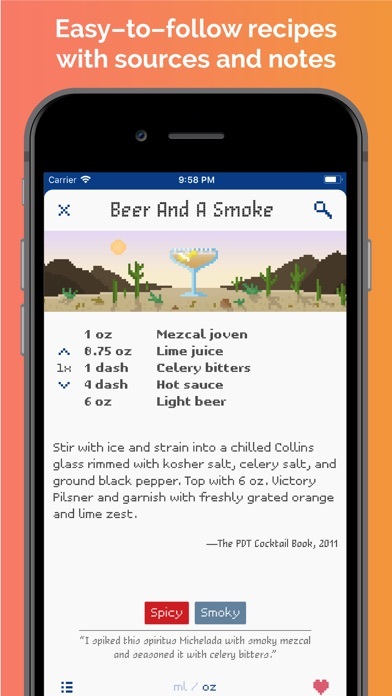 With Mixel, mixed drinks have never been so easy. Unlock over 1000 craft cocktail recipes, including holiday cocktails! We'll show you the best cocktails you can make using the ingredients you own. With over 1000 unique recipes and mixed drinks from world-renowned sources. Unleash your inner mixologist. 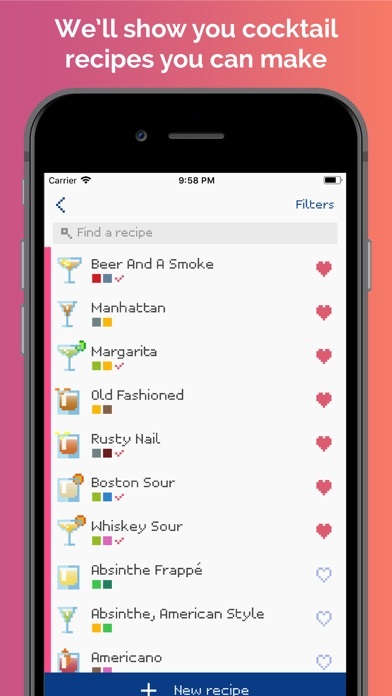 Stock your bar with the ingredients you have, then filter and sort drinks by those you are able to make. Want to try a new drink you're sure to like? Sort by flavor or search by ingredient. Keep track of your favorite drinks or ones you haven't tried yet. Search titles, ingredients, sources, and more to find the perfect drink for any occasion. A cocktail for every taste. Vodka drinks like the Martini and Cosmopolitan. Rum drinks like the Mojito. Tequila cocktails like the Margarita. We have them all. Input your ingredients and throw a cocktail party! Missing a recipe? Create your own cocktail and share with friends. Your information is backed up to the cloud, so your data is always available. Switching devices? Just sign in to your Mixel account to pick up where you left off. Why Mixel? You'll see... we designed the app to use a delightful 8-bit pixel art style. It's just as fun to use as it was for us to make. So get started! Want more details? How about... • Over 1000 curated cocktail recipes from only the best published sources. Classics, variations, modern takes, and one-offs. The best cocktails—they're all here! • Broaden your horizons. Unlock packs of themed recipes including holiday cocktails, gin drinks, whiskey drinks, vodka drinks, tiki cocktails, and many more! Aperitivo anyone? • Over 500 ingredients to add to your bar, all with beautiful pixel art. We made sure not to leave any out! • Quickly view all recipes that use a cocktail ingredient. Great for discovering new favorite drinks! Really like champagne? Try the French 75! • Not sure if what you have at home will work for a recipe? 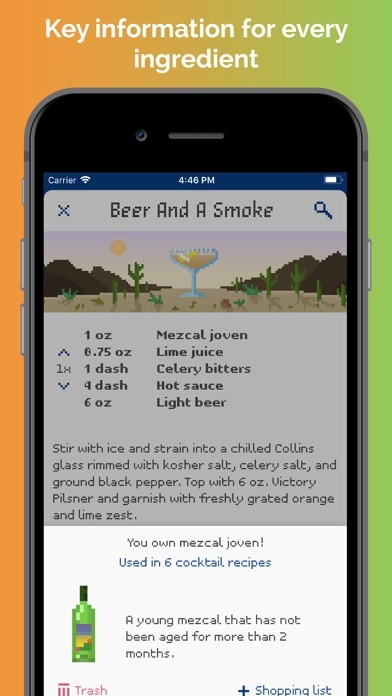 Tap an ingredient and get the essential information. Does a margarita recipe use orange juice? Find out quickly and easily. • Create, customize, and share your own personal recipes. Pro tip: Tag us on Instagram and we may put your recipe in the app! 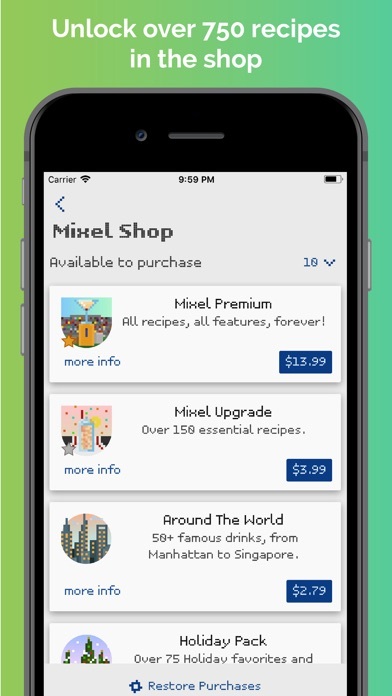 • Add any ingredients you may need to a shopping list, directly from Mixel. Keep track of your cocktail inventory. Included FREE • 80 classic cocktail recipes and all 500+ ingredients • All features described above PLUS: color themes, customization, convert to metric units... • Mixel Maximizer: Calculate which ingredients you should buy next! Upgrade to unlock • More recipes, organized into specialized packs (gin, vodka, whiskey, tropical, holiday, etc.) • Holiday Pack: Classic and interesting drinks to keep you warm. • Mixel Pack: 280+ of our favorite recipes • Premium: All 1000+ recipes, plus any recipes and features added in the future. The best value. This app is absolutely amazing for managing your bar and trying new recipes. I’d highly recommend paying for some of the premium recipes as they are great quality from highly renowned sources. I’ve tried a bunch of other cocktail apps and this one is hands down the best. Awesome devs who listen to the community. Highly recommend! I absolutely love this app! It’s everything I have ever wanting in a cocktail app. Every single detail from seeing what you can make with what you have, the shopping list, and my personal favorite the little bit that lets you see how much more you could make by adding whichever ingredients you’re thinking about. Also love how it tells you about subbing different things. Like in one recipe I saw it said I can use triple sec instead of having to buy cointreau. Also the flavor filters are amazing. Just all around a wonderfully done app and I definitely bought the entire unlock after fully exploring the initial options. Did not regret a thing. The thing this app gets right is that spirit brand names fall onto categories of spirits, and some of those categories are similar enough to be somewhat interchangeable. Most cocktail recipes are developed as essentially advertising for specific brand names, which makes the recipes confusing for people who don't know much about them or which other spirits are likely to be similar enough in flavor profile to be used instead. This app does away with brand names for the base spirits altogether (though they're smart enough to include them in the database so you can still search for them) and tells you which of your character- driven liquers will work well enough when a recipe calls for something else. The only thing I actually need to use my experience-based bartending knowledge for when using the app is to make adjustments in recipe ratios to compensate for the flavor differences that I "know" to be true for such substitutions, but I can see future iterations of this app (or one like it) being able to do this as well if the flavor characteristics are appropriately coded in the back end. Great job you guys, this is the app I recommend to people who are looking to get going with their home bar. Disappointed that an app with so much potential would throw it all away with a gimmicky and ill-suited graphical interface approach that significantly degrades usability and function. Possible the regular UI is just as poor and not simply the fault of the cheap graphics, but I couldn’t even get far enough in basic utility with the app to test that out. You tell it what ingredients you have, it tells you what you can make. It's brilliant and simple and worth every penny. I found this app when my bartender at The Haymaker in Raleigh NC created a custom drink with Pimms for me called “A Sworthy Brit” and texted me a Mixel screenshot of the recipe. Wish we could see recipes from other users so I could see it in the app, but I get the “curated” thing. Anyway it’s a handy app. 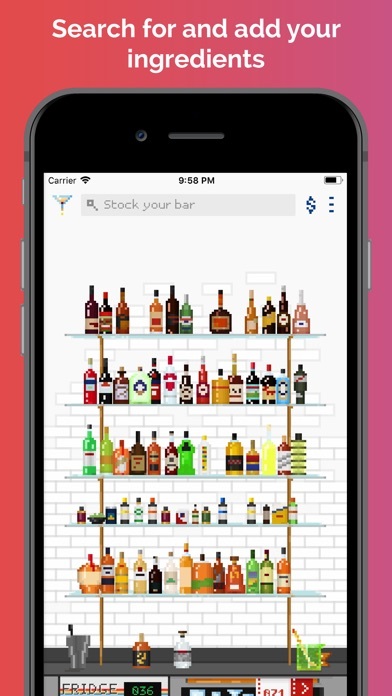 Love the design, and I easily input my home bar, unlocked everything in the app, and now have hundreds of great drink recipes. Well done! Absolutely love this app. Extremely helpful for a new bartender as well as someone experienced looking for their next creation! I love the maximizer function as it allows me to know which ingredient i need to buy next in order to maximize the amount of cocktails i can make! 5 Stars! Very inventive, I don’t need the other apps I downloaded to test out - this will do fine. This app gives you all the freedom in the world to stock, learn, create and explore. It’s digital theme, sound effects and the ability to customize not only your digital bar but the little things like the font style, sound, and even the apps color options add a great touch - the little things add up. A great amount info and overall style, I love how we can build a collection of our own creations. I really don’t drink much, but it’s very interesting to try new drinks and experiment here and there ...wether we’re good at that or not. Doesn't stop me from taste testing. The app makes it more fun. And lastly this app was free but I see myself visiting their Mixel Shop soon to see what other ingredients are out there.